Flight to Manchester International Airport followed by train or taxi to Liverpool. For most international delegates travelling from Outside Europe, this may be the preferred option. Flight to any London airport followed by air shuttle to Liverpool John Lennon Airport, or train to Liverpool Lime Street station, or National Express bus to Liverpool 1 Bus Depot. The conference will take place at the Hope Park campus of the University and the postcode is L16 9JD. The Proceedings of the SocProS 2019 will be published by AISC series of Springer. 10 papers will also be selected to be published as book chapters in "Algorithms for Intelligent Systems" book series of Springer. 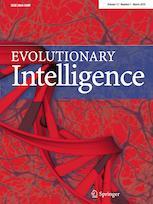 Selected papers will be invited to submit the extended versions to "Evolutionary Intelligence". The journal is ESCI and Scopus Indexed. Selected papers will be invited to submit the extended versions to "SN Applied Sciences" an open access journal by Springer. Selected papers will be invited to submit the extended versions to "International Journal of Swarm Intelligence" .